The 10-line BASIC contest is back for 2019! You are welcome to also post your entries here for Atari folks to see publicly. I'm going to do that! But that doesn't submit your program to the contest, only emailing Gunnar will. I'm copy-pasting the rules here. Notable new rules: the FREI category is gone; there's a new "public's choice" award. And remember for the PUR-80 category, only factory built-in BASIC variants are allowed. Authorized BASIC dialects: All line orientated BASIC dialects are allowed with a restriction in the category "PUR-80"
Since the jurors can not have the original hardware of all approved systems available, the system must be emulatable. The authors provide a recommendation for an emulator and briefly describe how to start the game. Since there were no posts in the category "FREI" last year, this category will be canceled. The known other three categories remain unchanged from the previous year. Program a game in 10 lines (max 80 characters per logical line, abbreviations are allowed). Last year some programs were submitted that weren't games. We would be happy to see again so many nice contributions, even if they aren't games, or if they have more than 10 lines of code, or if they are not compliant to the rules. They are grouped in category "WILD". I am not involved with the contest other than a participant. 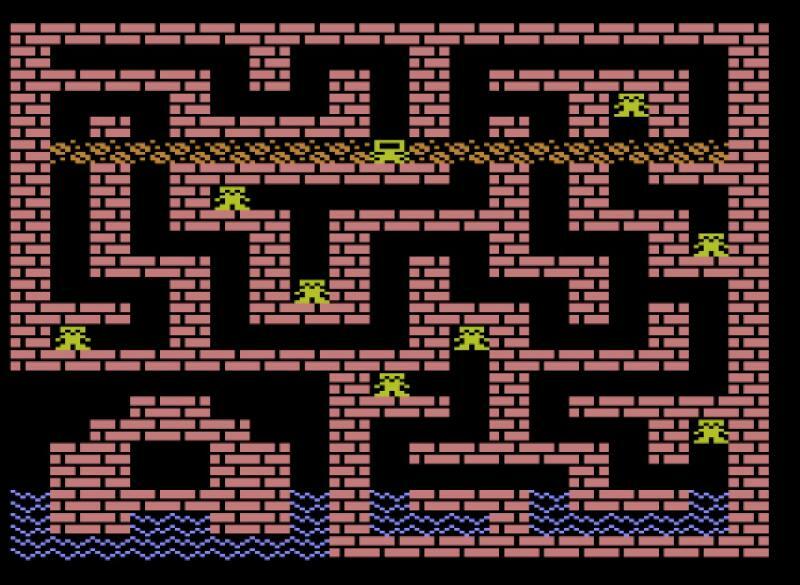 For the Atari 800 there were three official factory basics, Atari Basic, Atari Microsoft Basic (1), and Atari Microsoft Basic (II). I think it's sad we get hobbled by the built in basic rule as that didn't happen for years later... all the while other machines got basic upgrades on proms like the TRS machines.... sigh... prom on a cart or prom on the board, shouldn't make a difference! Just so long as it was an official FACTORY from the Computers Manufacturer BASIC! Edited by _The Doctor__, Thu Jan 31, 2019 12:23 AM. Feel pity for the TI-99/4A users, as the built in BASIC only supports one statement per row IIRC. They're more or less eliminated from the PUR-80 category. I believe the same goes for e.g. the ZX-81. 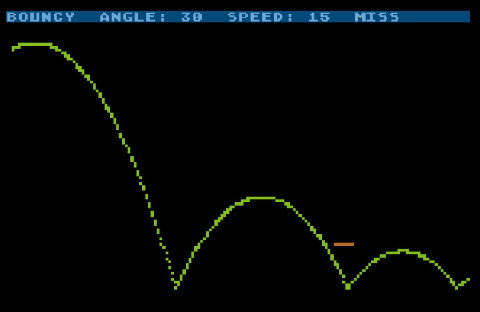 I'd pity the C64 guys more than us, their built-in BASIC needs POKEs for all graphics. As I always say, Atari building BASIC XL into XLs or XEs would have rocked, but they must have been on the "it must be cheaper to compete with the C64" track already when the 600/800XL came out so they probably didn't want to pay for license fees. I'd only consider PROMs legitimate if any machines were actually delivered with them. But let's not take it too seriously. Oooops! "line oriented"? dmsc's FastBasic is not line oriented... it lacks of line numbers!!! I already have an entry for the contest in that dialect. I agree that those built-in basic are nor fair against other versions, however, built-in Atari Basic C revision is good enough. Line oriented does not say it needs line numbers... But it has to be line oriented because otherwise one cannot count 10 lines. Of course, there are different opinions. My goal is to integrate as many 8-bit computers as possible. I find it interesting to have a category where you have to get along with the on-board resources that the machine was delivered with. Those who disagree can focus on the other two categories. I suppose 90% of users never used anything but the built-in BASIC back in the 80s, so I think it's OK to have a category that is limited in this way. my Atari 800 came delivered with both Basic Cartridges at the time, they sent AMS II Basic to me when that was ready as well, all 3 were official. They weren't third party. The were made specifically for Atari, produced and delivered by Atari, is all I'm saying. Go back the first magazines and you will see the listing are almost all for Atari Microsoft Basic. Factory options. Same goes for the TRS machines the os and basic were official offerings, though not always as handy as a cartridge, not third party. It's a simple point of fact. Edited by _The Doctor__, Thu Jan 31, 2019 7:59 PM. Does that include SYS/CALL/whatever to the built-in ROMs, or just that one can't install your own machine code routines? If BASIC automatically zeroes all variables on RUN, does that count as hidden initializations so all variables need to be manually reset? Does system variables, video RAM, I/O addresses count as storage? I see from Savetz example that he got several POKEs into low memory, so I suppose all those are fine which in the other hand makes me wonder which type of POKEs would not be allowed. 2. In the case of Atari, that used to be to avoid the use of the USR function (or a DOS statement with a DOSVEC pointer changed), but it currently means that you cannot call custom machine language routines. That is because there are systems that the only way to call OS built-in graphics/sound routines is with such a statement from BASIC and that could be fine. Trivia: there was a game that was classified as WILD because it made a custom M/L routine by some copy&paste of OS M/L segments into RAM and used it. 3. Auto reset variables on RUN or DIM are OK. This only means that you cannot add data (images, charsets, array data, etc) appended to the loading BASIC file (outside the visible 10 lines of BASIC code). That technique was used on systems like Sinclair. If the examples were removed from the rule, I guess that it was because many systems do not have a DL, P/M graphics or sprites, but I think that the idea remains, so the answer should be yes, you could POKE to color shadow registers and such... If not, I quit!!! Thanks for the reply. I'm having an entry underway (not Atari though) and believe it should adhere to the rules. I'll see if I can fine tune it a bit, as it currently reminds me more about a crap game than something one would want to play again but it was an interesting challenge to fit in PUR-80, in particular as I tried to keep the source as US ASCII (no control codes or printed graphic symbols, though I know those are allowed). Sorry vitoco, this sat on my desk while you answered and I didn't reload before posting. If BASIC initializes all variables I wouldn't consider that hidden but system behavior. While the German word used in the rules translates to "storage", it is acceptable to use it in a more generic way referring to "addresses", which I assume is meant here. 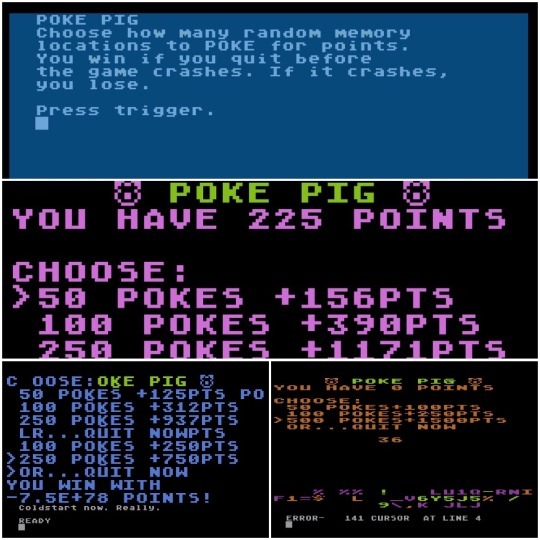 As you can't get any graphics at all without POKEs to registers on a C64, prohibiting them would give all Computers with graphics commands in their standard BASIC an unfair advantage. What editor do you use to code? In your FastBasic code I see Atari special characters.